What can I beemind with Duolingo? 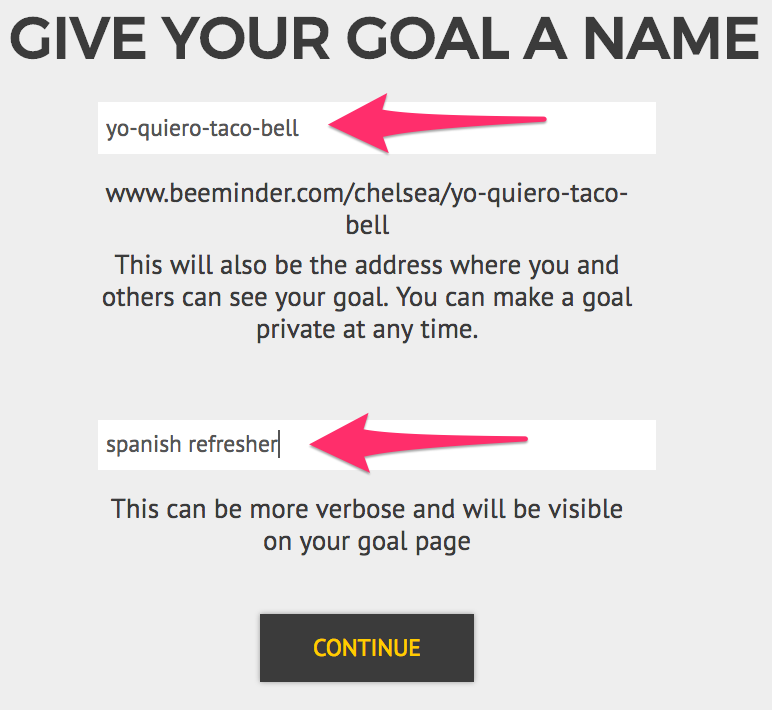 Beeminder tracks your points in one (or more) of the 20+ available languages. See here for a full list! Can I track multiple languages? Yup! You will need a separate goal for each language, and you'll want to use the same native language for all courses (scroll a couple questions down for more info). Can I have a non-midnight deadline for this autodata goal? Yes! Change it in the reminder settings. All the normal deadline restrictions and rules apply. Beeminder just dropped all my points! This most often occurs after you changed your Duolingo username or native language. If you've changed your username, contact Beeminder support and tell us your new username. We'll update your goal with the new information. If you've changed your native language, changing it back to its previous value should fix the problem, and fetching new data will restore your points. This happens because we don't get both English -> French and Spanish -> French points when you track French points. It only sends the points value for the course associated with your current native language. If you want to restart your language progress, see the next question for how to do so safely. If none of these sound right or solve your problem, contact support! 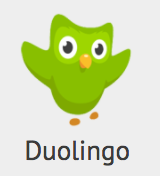 Can I restart my language progress in Duolingo without derailing my goal? Yup! First, restart the language in Duolingo, so that you have 0 points. Then go to your Beeminder goal and force a data fetch, so Beeminder gets a 0 datapoint. This will reset the odometer, so Beeminder doesn't lose your progress thus far. You can then start using Duolingo again normally! Advanced Beeminder tip: to correctly reset the odometer, you need to have the 0 datapoint in-between the highest value and the smallest value. If you started working on the language again before reading this question and already synced a low number, you can edit the tiny datapoint to 0, then force a new fetch to fix things. I don't see the language I want on the list. Can it be added? Possibly — email us to get the feature request in. Last time we did it in less than two days! 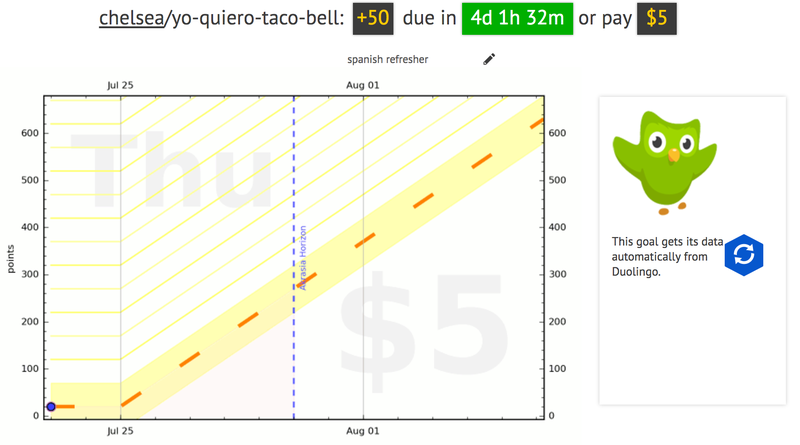 Click the Duolingo icon to start a new goal using Duolingo data. First, type in your Duolingo username so we know whose points to fetch. 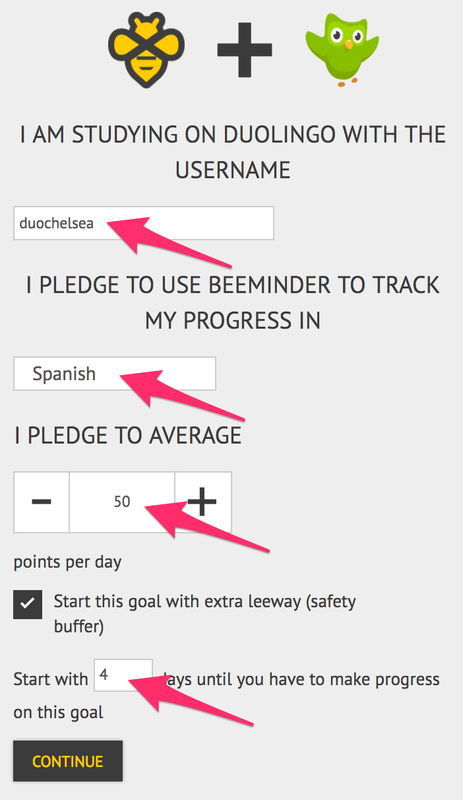 Then pick the language and the number of points per day you want to commit to. Lastly, if you want to delay your goal's start a few days (maybe you're traveling this weekend), be sure to tick the Start this goal with extra leeway box. Enter the number of days you want to delay and press Continue. And that's it! I'll need to get 50 points in the next 4 days to avoid paying Beeminder my first $5.